Shimla, Oct 9 (IANS) Two days after Congress Vice President Rahul Gandhi endorsed his chief ministerial candidature in the coming assembly polls, Himachal Pradesh Chief Minister Virbhadra Singh on Monday said the move had put the opposition BJP on edge. “Certainly, it has given a push to the Congress ahead of the assembly polls. There has been a massive public response after Rahul Gandhi announced my chief ministerial candidature,” an elated Virbhadra Singh told reporters here. “The Bharatiya Janata Party (BJP) should also declare its chief ministerial candidate. Let the people know who is going to be their leader. They will vote on the basis of CM (Chief Minister) face,” Virbhadra Singh said. He also said that winnability will be the criterion during the allotment of Congress tickets and the party will not disturb any sitting MLA unnecessarily. 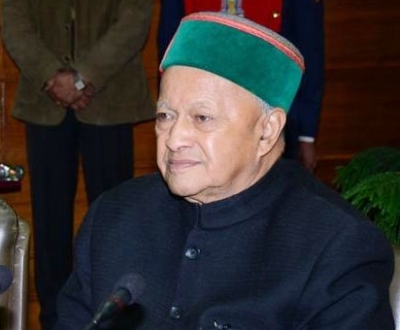 Virbhadra Singh and his family are accused of amassing wealth of Rs 6.1 crore which is allegedly disproportionate to his known sources of income between 2009 and 2011 when he was the Union Steel Minister. The Enforcement Directorate had filed a money laundering case against the Chief Minister, his family members and others after CBI action in this regard in September 2015. Ending months of speculation and turmoil within the party, Rahul Gandhi on Saturday said at a public rally in Mandi that Virbhadra Singh will “become the Chief Minister for the seventh time”. “Virbhadra Singh ji has done tremendous development as six-time Chief Minister. He will be the Chief Minister for the seventh time. This will have the full backing of the party,” he said. Asked which constituency he will like to represent in the next assembly, the Chief Minister said he might contest from any seat. Last month, he said his son Vikramaditya Singh will contest from Shimla (Rural), the seat he represents in the current assembly. Polls for the 68-member assembly are likely to be held in November.